I captured a brief moment when Willie Nelson, Kris Kristofferson, and Merle Haggard lingered for a pre-show interview. The Grammy Awards show really begins hours before the telecast, when performers and presenters arrive to rehearse. Moreover several entertainers and industry figures receive awards during a separate ceremony before prime time. Nelson, Kristofferson, and Haggard reminded me of three giant figures from Mount Rushmore. I used a black-and-white filter to accentuate that impression. Musselwhite and Ben Harper ended up winning a Grammy for Best Blues Album. 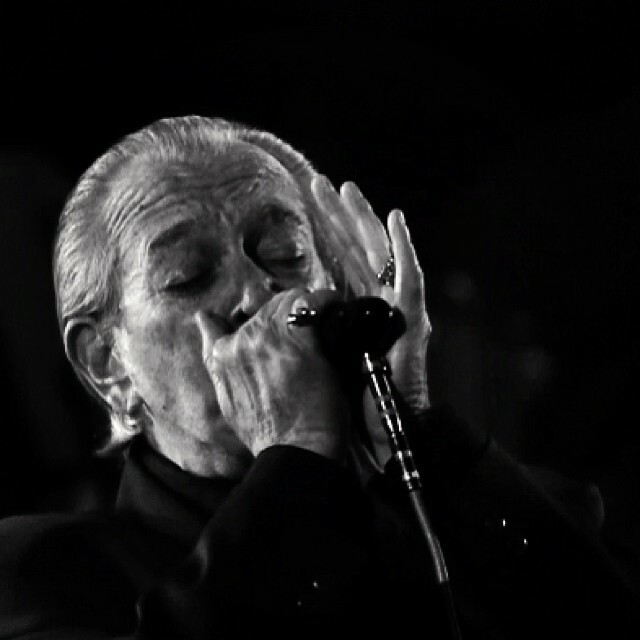 Black-and-white seemed to capture the essence of the gritty blues giant Musselwhite. When the prime-time telecast began, the Grammys really kicked into high gear (thank you, Beyoncé and Jay Z). The energy behind the scenes was palpable, too, as musicians began collecting their awards and celebrating. I kept my attention focused on the official portrait room, where handlers and photographers fuss with the stars before taking their official post-victory photos. 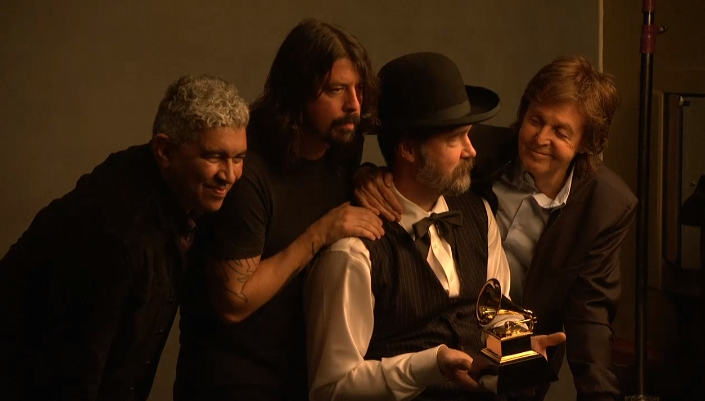 Here is a screen shot I took watching Paul McCartney, Krist Novoselic, Dave Grohl, and Pat Smear prepare for a photo shoot with their Grammy for Best Rock Song. McCartney gently showed Novoselic how to hold the Grammy trophy properly for the camera, pretended to chew on his hat, and then flashed him this sweet, unguarded glance before they took their official photo. 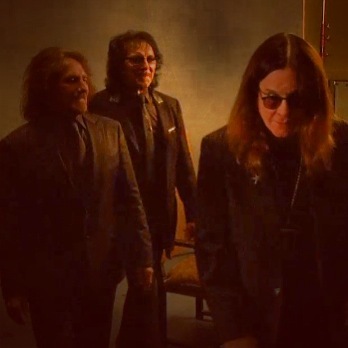 The photo I captured here shows Osbourne flashing a malevolent smirk, as the band exits the portrait room to endure their interview. The Grammys never knew what hit them. By contrast, Kacey Musgraves, winner of two Grammys, showed why she has emerged to challenge Taylor Swift for the unofficial title as queen of country. Backstage, she flirted and joked the Grammy photographers, playfully posing with simple props such as a table. The Kacey Musgraves behind the scenes was as engaging as the one who charmed the world during the telecast. My one quibble with the Grammys: the prime-time telecast itself was not streamed live. The Grammys need to come to grips with the fact that we’ve broken free from the exclusive dominion of television. TV ratings no longer tell the complete story of the Grammys. Our eyeballs are glued to our laptops, iPads, and smartphones as we experience the event and share content. The Grammys need to measure the complete experience more effectively to give advertisers a true picture of the show’s popularity. But, for now, I’ll take what I can get: an opportunity to step out of the role of viewer and become a Grammy visual storyteller. This entry was posted in Entertainment and tagged " Pharrell, Ben Harper, Beyonce, Black Sabbath, Charlie Musselwhite, Dave Grohl, David Deal, Geezer Butler, Grammys, Jay-Z, Kacey Musgraves, Kris Kristofferson, Krist Novoselic, Lorde, Merle Haggard, Ozzy Osbourne, Pat Smear, Paul McCartney, Superhype, Tony Iommi, Willie Nelson. Bookmark the permalink.